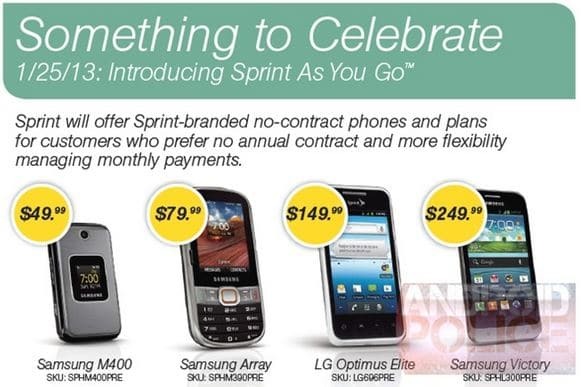 Sprint later this month will launch its prepaid plans named “Sprint As You Go.” According to leaked internal documents, Sprint will begin to offer contract-free plans starting January 25th. The plans will be limited to four phones only once “Sprint As You Go” start being offered, two smartphones and two feature phones. Sprint will offer the LG Optimus Elite and Samsung Victory to those who want to purchase a smartphone for a price of $149.99 and $249.99 respectively with no subsidy. Those looking for a cheaper price will be able to buy a Samsung M400 or a Samsung Array for $49.99 and $79.99. Plan for feature phones will cost $50/month while $79 for smartphone plan. The plans include unlimited data, text, and voice.